"Today, the long-held belief that nature has a direct positive impact on human health is making the transition from theory to evidence to action... And many of us, without having a name for it, are using the nature tonic. We are, in essence, self-medicating with an inexpensive and unusually convenient drug substitute. Let's call it vitamin N - for Nature"
Blogging has taken a backseat over the past few weeks while I've been a "mombie": a hybrid mom [mum] / zombie creature characterised by dark circles under the eyes, aimless wandering, grunting responses and relentless caffeine hunting [oh no wait - the last part's normal]. This semi-catatonic state can primarily be attributed to our toddler's recent grommet/adenoid surgery and recovery, immediately followed by his third bout of bronchiolitis this year alone. Combine serious sleep loss with über busy days at work and - voilà - you've got yourself a[nother] mombie on the loose. Talk to the hand people! 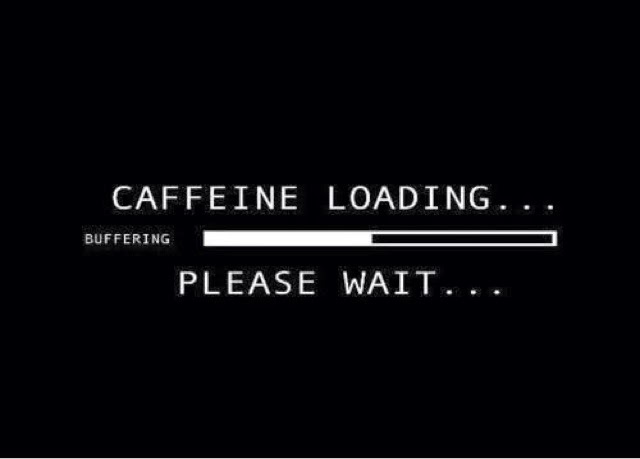 Even the most basic of tasks that morning were hard work. Relief came with the toddler's daytime sleep and Peppa the Pig for the five-year old, enabling me to collapse face-first for a brief, drool-worthy, snooze on the couch. A post-nap caffeine reload put me partially back into the land of the living and I decided to fulfill a promise to take the kids to Adelaide's Belair National Park. We cobbled together a picnic and made our way from the coast to the hills. The changes in cityscape fostered a brewing excitement and on entering the park we were instantly rewarded with an emu passing in the middle of the road. And just like that, thoughts of the city vanished and we were refreshingly plunged in to the natural world, making our way deeper into the park with perceptible anticipation. First stop was the park's native plant nursery to pick up some more plants for the backyard. 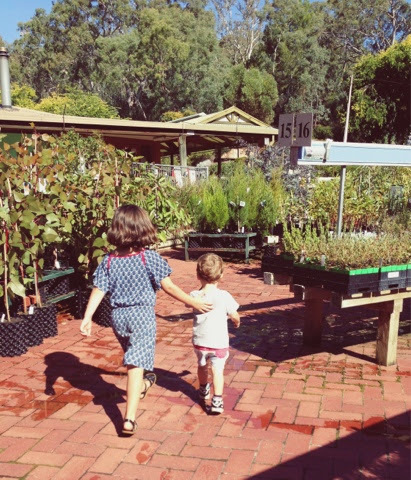 Shopping with young kids is always an "interesting" experience, and this exercise proved true to form: as I attempted to pay the toddler became obsessed with a ceramic wallaby statue, administering swooping bear hugs and smatterings of kisses. Two tourists stopped to cluck over his love for Australian fauna, and his sister - sensing the audience - raced in, hooked him around the waist and lugged him off, loudly exclaiming "come here ya little bugger!". Murphy's law dictates you'll discover your kids know certain words at the most inappropriate moments. Awkward. Immediate exit stage right. Enter Adventure Playground*. 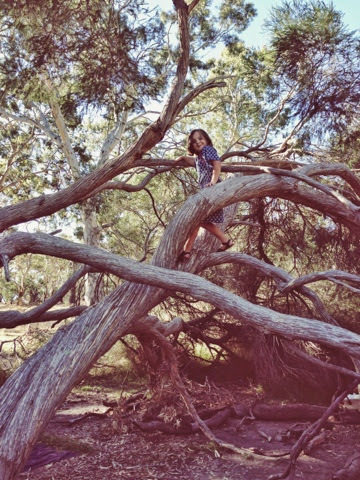 The place is truly an oasis in the midst of city living: an adventure playground set to a backdrop of bushland and a soundtrack of birds singing out across the landscape. We arrived to see kids playing across the expansive playground - in the fort, all through the cluster of large concrete tunnels, wooden balancing posts, and around the park proper. My two needed no encouragement and were immediately off and running. I kept the hummingbird parenting analogy I recently wrote about in mind and took a backseat to their play. Having just turned two the toddler needed more assistance but in making an effort to stand back I realised he was far more capable than I give him credit for. His sister took a lead in helping him navigate through the tunnels, and I realised I didn't need to worry so much. I could noticeably feel the tension and fatigue leave my body as I was - shock horror - able to sit back on the grass, absorb the sunshine, and watch them play amid a mass of equally thrilled kids. Later in the afternoon we enjoyed our picnic then set out to explore the playground's surrounds, where we discovered hollow Eucalypt tree trunks and a climbing tree / hide-out featuring an impromptu fireplace and log-seating. As afternoon turned to early evening people started to make their way home. My two weren't remotely interested in leaving - and nor was I - so we bucked normal routine and stayed on until past dinner. To our delight a couple of emus boldly made their way from the bushland through the playground, triggering us to undertake a successful tracking session through the broader park. Whilst walking back from our emu adventure, we disturbed a large colony of rabbits - to the kids rapture and my environmental manager's horror. Again the kids were off and running, then loudly "sneaking" through the bush before finally coming to a standstill to listen and watch for the rabbits. We stood there in the scrub and blackberries, our eyes peeled, listening to the call of the birds at twilight, and looking up to watch the breeze stir the leaves and tree tops. Pure magic. 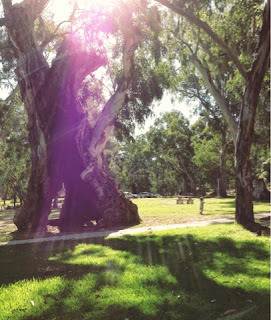 We traveled home that evening full of animated discussion, debriefing on emus, rabbits, kookaburras and climbing trees. I still felt weary but incredibly serene: the effectiveness of nature as an outlet for the kids and as a tonic for my grogginess and fatigue was striking. It appears that Vitamin N is an ideal remedy for kids and mombies alike - and this mombie is prescribing away. 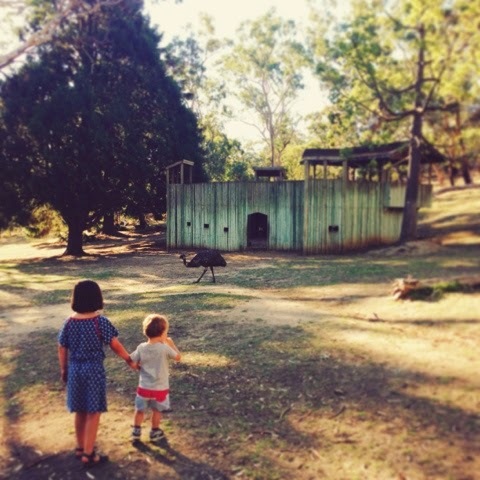 *Adelaide-based photographer Cath Leo recently wrote a great review on the Belair Adventure Playground for Play n Go Adelaide . It features some fantastic images and practical information - you can check it out here.